TORONTO - More than one-in-three Canadians expect they'll be carrying mortgage debt long after they turn 65, according to Royal Bank's latest housing survey. The report found that one-third of Canadians who are 55 or older have at least 16 years left on their mortgage term. A majority, 57 per cent, of survey respondents said they expect to have mortgages after the age of 55, with nearly one-third expecting to carry debt after age 65. Three-quarters of Canadians surveyed for the poll released Thursday said they want to be mortgage-free by age 65. But those expectations may be out of line with reality. 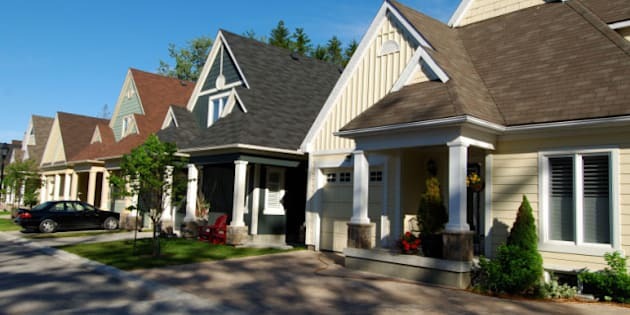 "Canadians want to be mortgage-free as they approach retirement age and beyond, but the reality is that it takes prudent planning and the right advice to stay on track," said Claude DeMone, RBC's director of strategy for home equity financing. "With many more people working to the age of 65, it is not unusual that that debt would be carried along." Concerns about post-retirement debt have been growing since the 2008-09 recession, when many Canadians saw the value of their savings drop — at least temporarily — due to big losses on equity markets. Although stock indexes recovered much of their lost ground during last year's recovery, fears have been rising recently amid extreme volatility in recent months as the European debt crisis casts a pall on the global economy. Since the summer, global markets have dropped over fears the Greek debt crisis could lead to a global recession. Some big pension funds lost about five per cent of their value in the third quarter alone. Another problem lies in recent statistics that point to seniors being lured by low interest rates to pile on debt. A recent TD Bank report noted that those 65 years old and older racked up debt at three times the average pace over the past decade. Some economists have suggested a growing proportion of older Canadians can't afford to retire after seeing their savings hammered by financial market turmoil. Research from Statistics Canada released last month found that a 50-year-old worker in 2008 could expect to stay in the labour force another 16 years — 3.5 years longer than would have been the case in the mid-1990s. That could mean fewer job openings for the about 1.4 million unemployed Canadians. In the United States where the unemployment rate is higher, workers are growing to accept that they may have to work long after they reach retirement age, according to a new survey by Wells Fargo & Co.
One of the striking results of the U.S. survey is that 25 per cent of the respondents said they'll need to work until at least age 80 because they will not have enough money to retire comfortably. DeMone of Royal Bank said the emerging retirement trends underscore the importance of planning at the early stages of taking out a mortgage. "It means different things to different people, so much of it will depend on their cash flow," he said. "As people are working later they may have reasonable cash flow that will protect them and take care of them into their retirement," he said. He used the example of a 45-year-old who takes out a mortgage with an amortization of 30 years and ends up with a mortgage until she is 75. But, DeMone said, she can proactive steps to pay it off sooner, such as increasing her payment periodically or making at least one extra payment per year. Despite some darkening clouds on the economic horizon, Canadians are still actively buying houses as the slowing economy means interest rates are expected to remain low well into next year. The majority of Canadians surveyed by RBC said they expected interest rates will remain steady over the next six to 12 months. A low interest rate is the most important feature for 96 per cent of Canadians when choosing a mortgage, the report said. The poll found that 46 per cent of Canadians were interested in fixed rate mortgages, up from 40 per cent in the first quarter of the year. Interest in variable rate mortgages has grown to 29 per cent, 10 percentage points higher than the earlier survey. Hybrid mortgages that have features of both fix-rate and variable mortgages was favoured by 25 per cent, down from 41 per cent. About four in 10 Canadian homeowners said they had no mortgage— the highest level since 2006 and up from 38 per cent in the earlier survey. The RBC Housing Snapshot poll conducted by Ipsos Reid Oct. 6 to 14 surveyed 2,282 adults. It has a margin of error of plus or minus two percentage points, 19 times out of 20.